Chipping Camden is another of the Cotswold wool towns. The word "Chipping" means market. 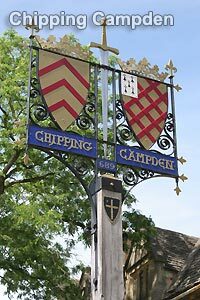 The word "Campden" is thought to be an old Saxon term meaning fields. Chipping Campden is kept in pristine condition by the Campden Trust which was set up in 1929. The trust oversees the upkeep of traditional skills of stonecarving and repair that makes Chipping Campden such a "perfect" picture of golden-coloured stone. Chipping Campden was a rich wool trading centre in the Middle Ages and many of the impressive buildings in the village were built on the proceeds of the wool trade. Today, Chipping Campden is a popular tourist destination for visitors to the Cotswolds who come to see its fine High Street, lined with honey-coloured limestone buildings, built from locally quarried Cotswold stone. In the centre of the main street running through Chipping Campden stands the Market Hall with its splendid arches, built in 1627. The early perpendicular wool church (Cirencester also has such an example) of St James, the Almshouses and Woolstaplers Museum are also popular with tourists. You may not think of Chipping Campden when you think of the Olympics, but since 1610 the town has been home to a championship of rural games, which is now known as Robert Dover's Cotswold Olympick Games. The event is held every summer on Dover's Hill, near Chipping Campden (which has fantastic views over the surrounding countryside). One of the events in the Cotswold Olympiks which has yet to find its way into the more famous Olympic Games is shin-kicking! The end of the Olympiks (Chipping Campden style) is marked by a huge bonfire and firework display, usually followed by a torch-lit procession back into Chipping Norton and Morris dancing in the square. One of the oldest hotels in the Cotswolds, yet with every comfort you could want, Noel Arms Hotel in Chipping Campden promises you a happy and relaxing stay, and a wonderful contrast of the past and the present. Since taking over Cotswold House Hotel in 1999, we have built on the traditions of this glorious Regency townhouse. Retaining the best of the character and architecture, we have revolutionised the accommodation, restaurants and service to make it one of the finest Cotswold hotels. Cotswold House welcomes children and also offers two ground floor cottage rooms that are accessible for wheelchairs (though not specifically designed for them). Stonecraft is a two minute walk from the historic high street of Chipping Campden, within easy reach of the many pubs, restaurants and shops. Accommodation consists of a twin and double, two doubles or, a family room for four and a further double all with en-suite facilities. Frances Cottage is a mid nineteenth house set on the Lower High Street in Chipping Campden. All our accommodation is non-smoking. You can book either our double bedroom or our twin-bedded room. Both rooms are spacious and have en-suite toilet/shower facilities, together with colour tvs, coffee/tea making facilities, and seating accommodation where you will be able to explore a selection of books on both the local area and it's history. No more Chipping Campden news at present.